CSUF students and faculty at the Experience Hospitality event. From left to right, Omar Hernandez, Marina Soriano, Monica Nguyen, Assistant Professor of Management Ellen Kim, Ivan Moc, Samia Ghandour, Chloe Cao and Irvin Aguinaga. Student Carmen Batres also attended but is not pictured. This spring, Mihaylo College students and faculty co-hosted the 11th annual Experience Hospitality Orange County event, which gave 200 high school students from Los Angeles, Orange County and the Inland Empire a behind-the-scenes look at the restaurant, hotel and resort fields. In April, the California State University Hospitality and Tourism Alliance, encompassing the hospitality programs at several local Cal State universities – including the Mihaylo College program offered by the Center for Entertainment and Hospitality Management – and the California Restaurant Association Foundation hosted high school students, hospitality professionals, and faculty and undergrads from several Southland universities for the Experience Hospitality Orange County event, a day of networking, mentoring and career development. A number of Mihaylo College students shared their experiences with high schoolers, discussing their decisions to seek careers in hospitality and their university experience. They also accompanied the students on exclusive tours of hospitality venues, including the Anaheim Marriott, California Pizza Kitchen, ESPN Zone, Hilton Anaheim, House of Blues, McCormick & Schmick, Ralph Brennan’s Jazz Kitchen and Sheraton Park Hotel. Ellen Kim, director of the Mihaylo College entertainment and hospitality program and an assistant professor of management, says engaging with the high school students, many of whom are from underprivileged backgrounds, is not only an investment in the industry’s next generation, but also opens doors of opportunity. 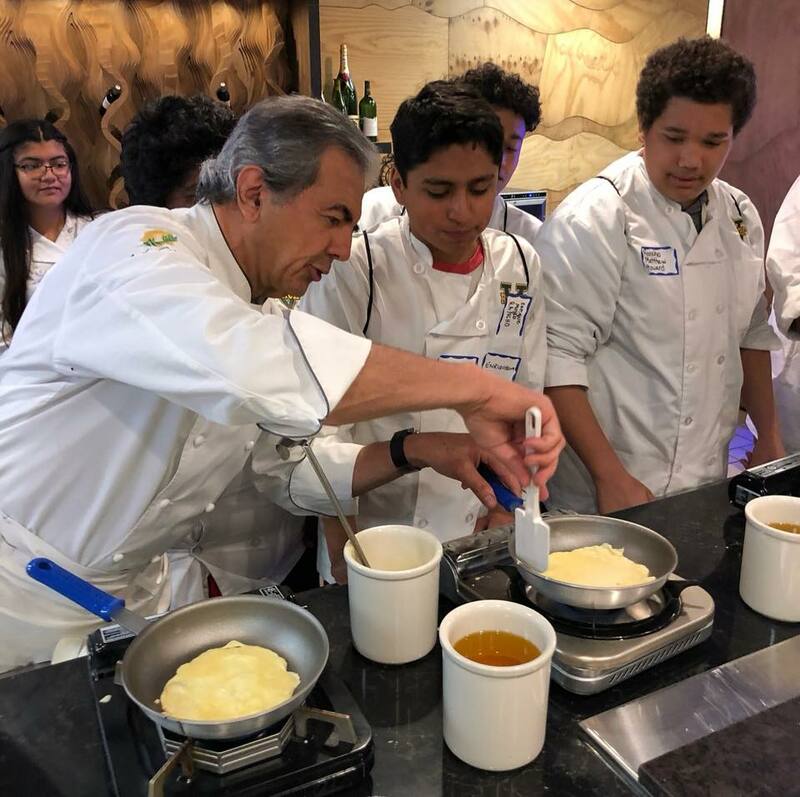 High school students discover the world of cooking with the help of a Southern California chef at the Experience Hospitality event. Samia Ghandour ’18, a Mihaylo College senior who volunteered at the Experience Hospitality event, says her desire to give others positive experiences drew her to the hospitality field and prompted her to share her story with high school students. Ghandour, along with three other Cal State students, led a panel discussion providing an introduction to college life and university-level hospitality education. “I shared with the high schoolers a little about the hospitality classes offered and how they relate to internships, the connections that we have with industry professionals and the industry experience that our professors have,” she says. Mihaylo’s Center for Entertainment and Hospitality Management (formerly the Entertainment & Tourism Management Center) prepares students for career opportunities by supporting the college’s academic program, offering networking events and supporting Behind the Scenes, a student club offering career development and social activities. For more information, visit the center online or at SGMH 5284.